Something you definitely cannot find in the UK, even in some of the best Chinese restaurants, is man tou – a Chinese white bread which is steamed instead of baked. Of course you can find ready made ones in the freezer cabinets in Chinese shops but it’s just not the same as the ones freshly made, straight out of a steamer. The result of the steaming is a super soft ball of fluffiness which, because the bread is steamed, doesn’t have a traditional bread crust. Instead, each dough ball forms a smooth, slightly stretchy skin on the outside but is fluffy, light and moist on the inside. 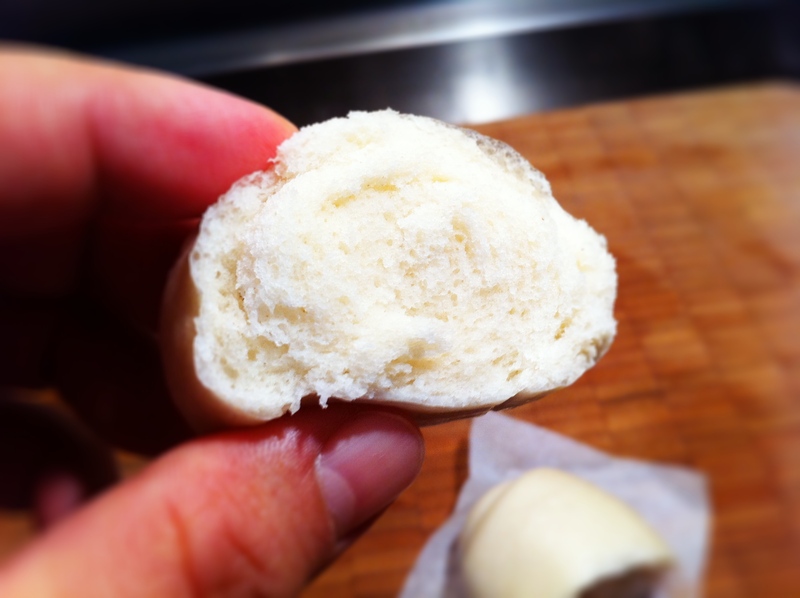 I’ve been searching for quite a while for a good man tou recipe online and I found one from this amazing blog – Almost Bourdain. I’m really pleased with the result today as it’s the first time I’ve tried this recipe but I have to say that it’s still not like some of the best man tou I’ve eaten in Singapore – the bread in this recipe has come out denser than what I’ve traditionally had at home. 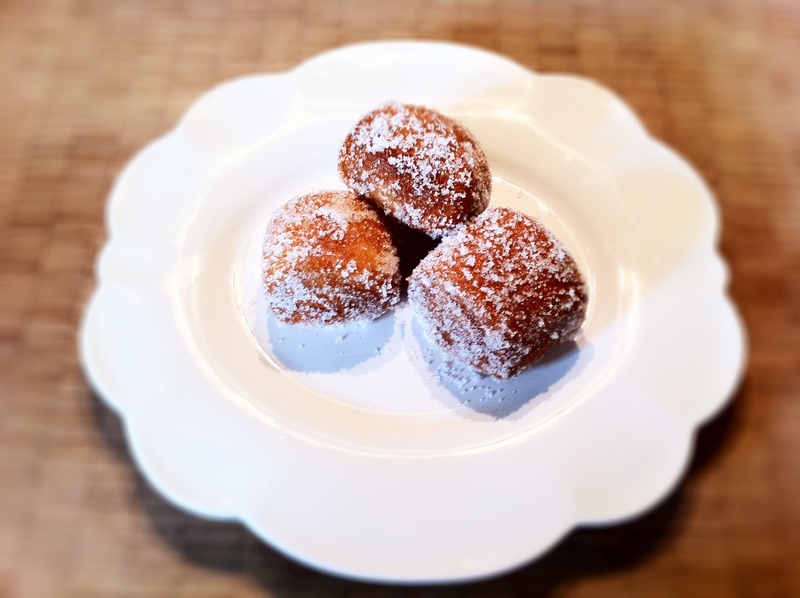 My husband reckons it’s the quality of the flour we get in Europe so I’m going to try making these again after a trip to London in Chinatown to see if I can get a better, lighter flour to use. Don’t get me wrong though, as a first attempt, nothing’s happier than my little tummy at the moment. These man tou are the most brilliant sponge for sopping up everything from curry to gravy… trust me, we’ve tried it all and it just goes with everything! The most important thing you’ll need to make these doughy balls of goodness is a steamer. My trusted but battered rice cooker, which I bought almost 15 years ago, comes with a separate steaming tray but if you don’t have such contraptions, I’d really recommend you invest in a little bamboo steamer to set over a saucepan of boiling water. You can find bamboo steamers in any good Chinese / Asian shop and they’re really, really cheap. 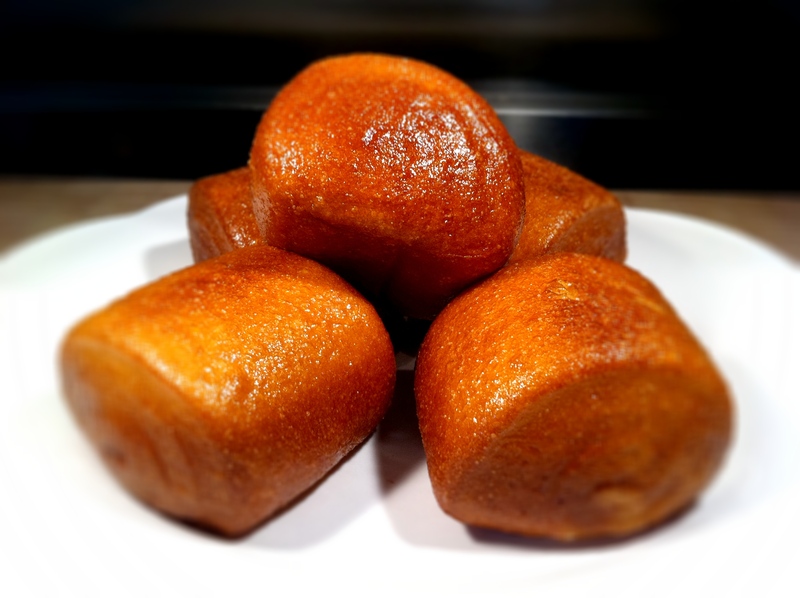 There are 2 ways to eat man tou, and that’s either freshly steamed when it’s all soft and fluffy straight out of the steamer, or subsequently deep fried :). 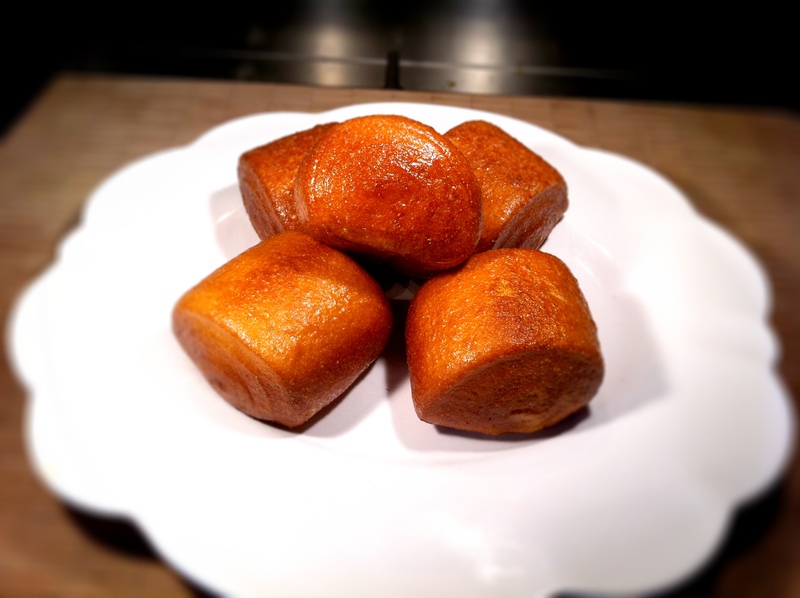 We’re making chilli prawns for dinner tonight specifically so that we can eat these fantastic fried man tou. 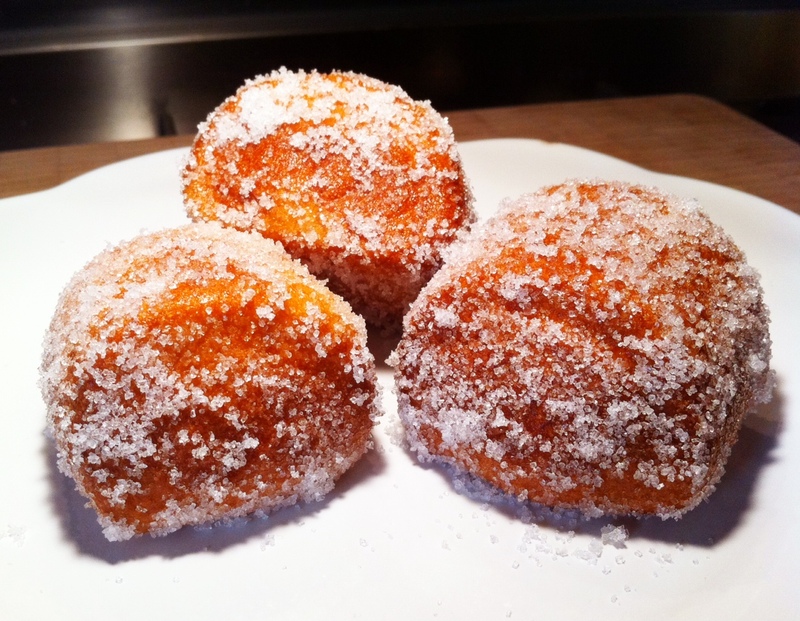 We also kept some to roll in sugar, effectively turning them into Chinese doughnuts! 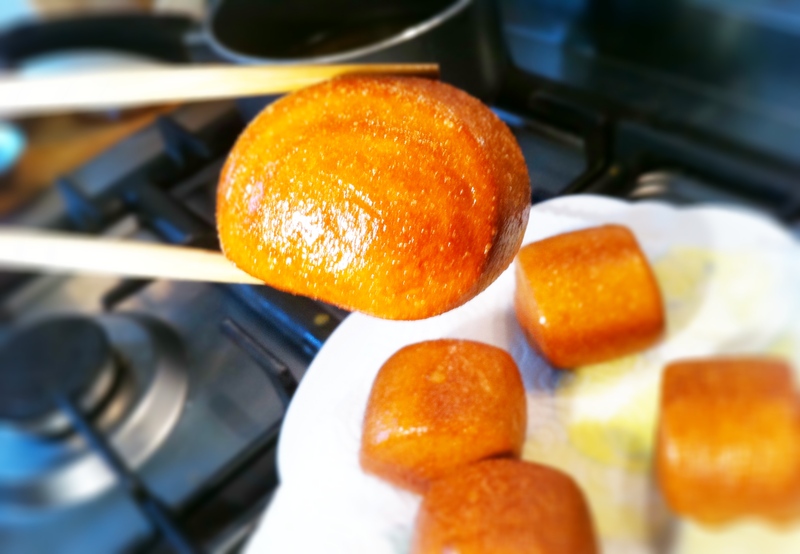 I have to admit that I ate a freshly steamed man tou with half a teaspoon of some salted butterscotch sauce we had left over (recipe here) and it was just divine! 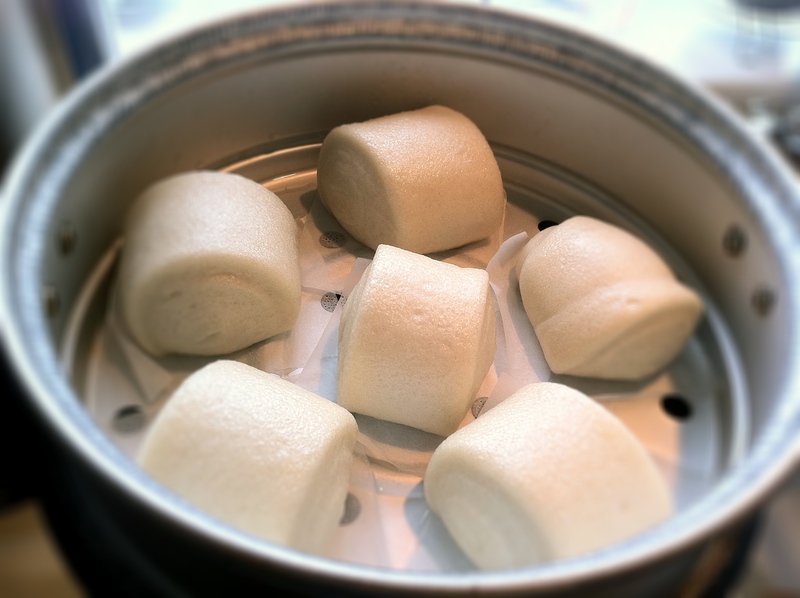 In terms of making man tou, they are just so easy to make and, unlike normal bread making, you can make the dough and have them on the table (or in your mouth) in less than an hour. Stir the sugar and dried yeast in the warm water until it’s dissolved. In large mixing bowl, pour the vegetable oil in the flour, along with the water/yeast/sugar mixture and mix until it comes together into a rough dough. 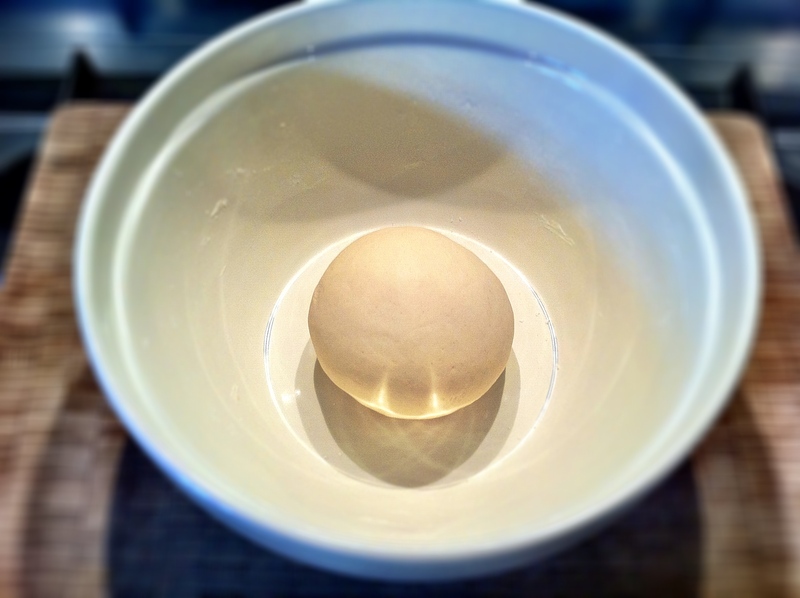 Turn it out of the bowl and knead the dough for about 10 minutes until it’s smooth and springs back when pulled. Let the dough rest for 5 minutes under a damp towel. 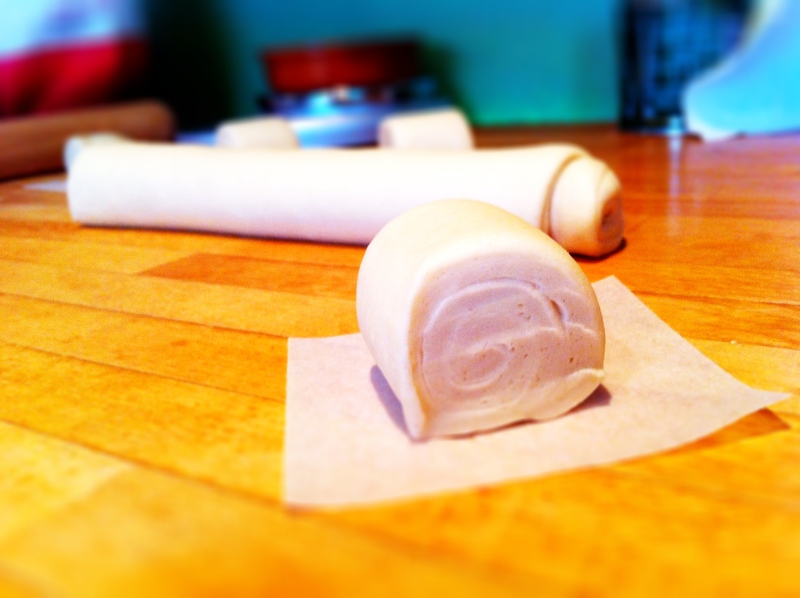 On a floured surface, roll the dough out to form a long rectangle. Fold one end into the middle, then pick up and fold the other end into the middle as well, forming a three-fold. Roll this out again into a rectangle. Use a basting or pastry brush and brush the top with water before rolling the dough up tightly. 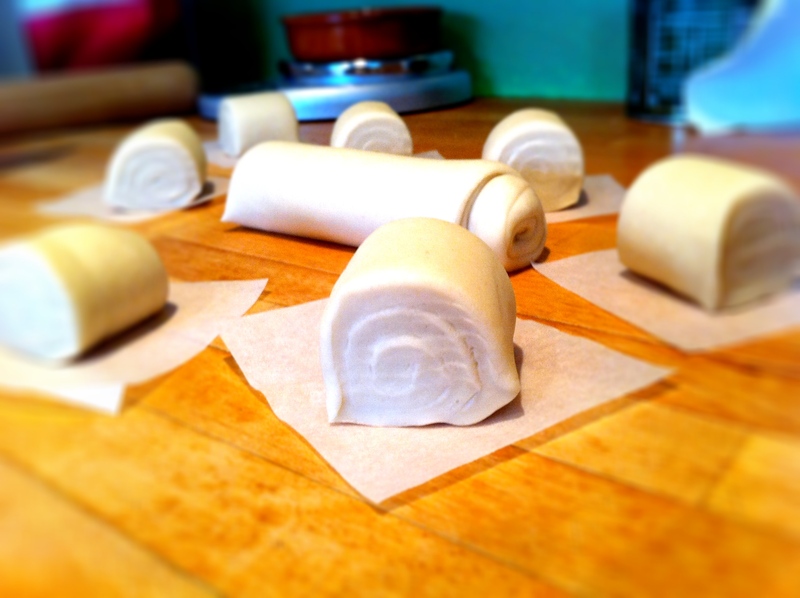 Cut into little rolls and place on individual baking sheets slightly bigger than the size of each roll. Fill your steamer with cold water. Place your rolls into the steamer and allow it to rise for 20 minutes before turning your steamer on (if you can’t cook all your rolls at once, leave them in a bowl covered with a cloth to rise separately). 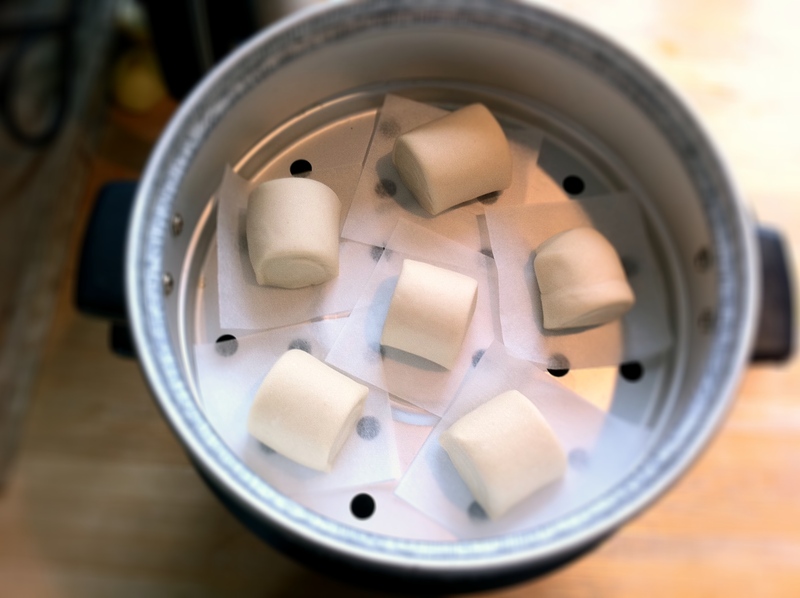 Steam your man tou buns for 15-20 minutes and serve them piping hot out of the steamer, or deep fry them. You can then eat your man tou buns however you want… to mop up curry sauce, or dipped in chocolate etc. Is this the same dough they used for steamed pork buns??? It looks like it but I’m not sure! Yeah, pretty much. 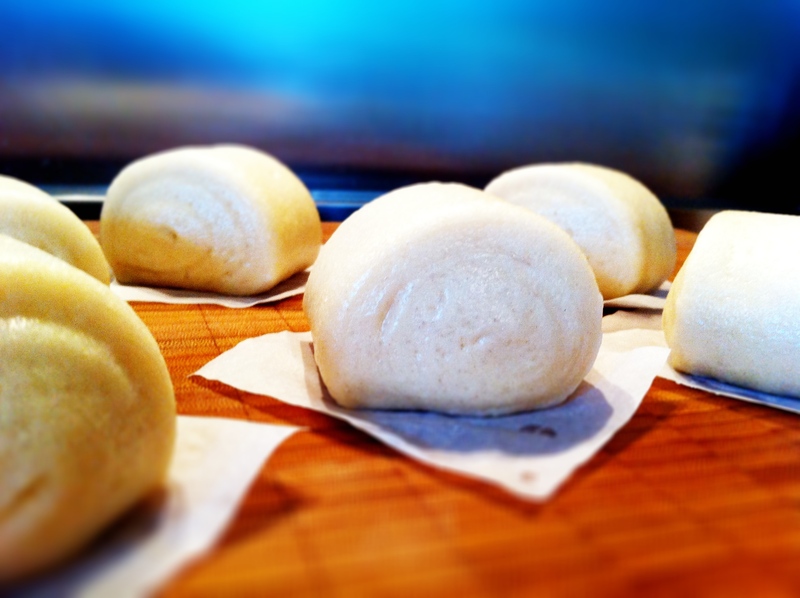 The steamed pork buns are what I was going to make later this week once I make some more of this dough. I’m researching various char siew marinades (for the roast pork) as I’ve yet to find one I think is genuinely authentic enough. Ooooo, those look delicious, and I’ve never heard about them before so thanks! Love the recipe, tried this last week and you’re right, they turned out a bit dense. Have you tried a different flour yet? I used all-purpose and am thinking of using bread flour next time. I did and actually found white flour at the Chinese grocery story called man tou flour. It seems to be a bleached and much finer plain white flour. I wouldn’t recommend a bread flour as that would be even heavier. The second batch I made was spot on so I’ll take a picture of the brand and send it to you. I’m very happy with the results of this new flour. Can anyone out there help? I have tried different receipes of mantou and I am having problems trying to get my mantou soft and fluffy like the ones you buy in the packet. I have managed to get one batch with the good texture but when I steamed it it turned brown.The flavour and texture is fine except for the color. Has anyone out there experienced this before ? Perhaps I have added too much yeast or baking powder , can anyone help? Hi, the first time I made this, I used normal all purpose flour and it did turn out denser than ones you get ready made. I found special man tou flour at my Asian grocery store, and my second batch turned out much better. They do turn slight creamy in colour but not brown. I don’t know what you put in yours but maybe send me a link to your post or you can compare your ingredients against the recipe I posted? can we substitute the plain flour for self-raising flour? I’ve never tried it so I can’t say. I’ll do an experiment next time and let you know. The deep frying, what a fantastic idea! I can’t wait to try it. Love your blog. Discovered while looking for New Years recipes! I used plain all-purpose flour. Worked beautifully. I rested them a little longer before steaming (about 45 minutes) than you suggested. Reblogged this on R-Shane Ee. i just want to ask, if i have to steam the dough before frying or i can fry the dough directly with out steaming it??? Oh LORD I’ve been looking for this recipe! I remember when i was in Spain Years ago and me and my Nan, granddad, mum sister and me went to a nice little Chinese restaurant, and i was curious about the chinese bread, the crunchy sweet shell and amazingly soft insides~ i SO wanted that recipe!